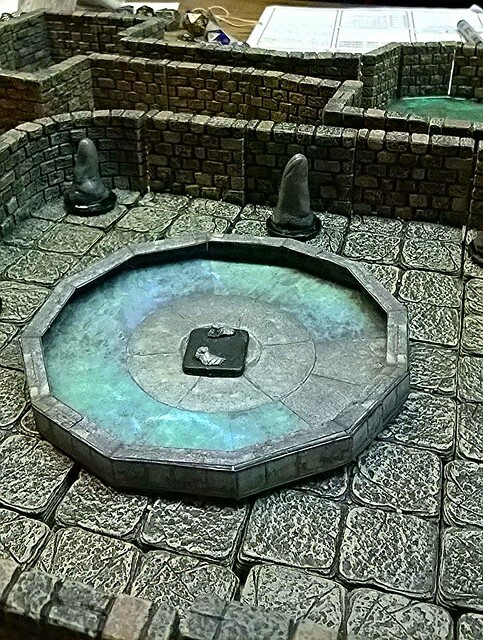 The following post contains detailed SPOILERS for The Oozing Temple an encounter area from the Out of the Abyss a part of the Rage of Demons campaign setting by Wizards of the Coast. 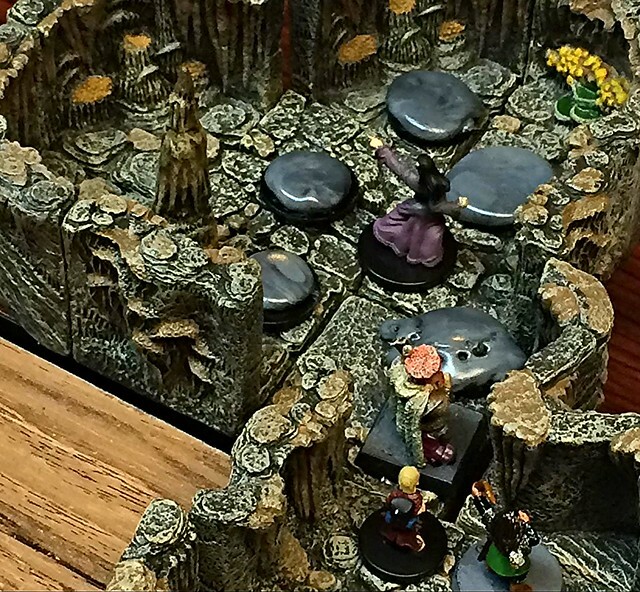 I ran this session at Games of Berkeley as part of the official Adventures League program. 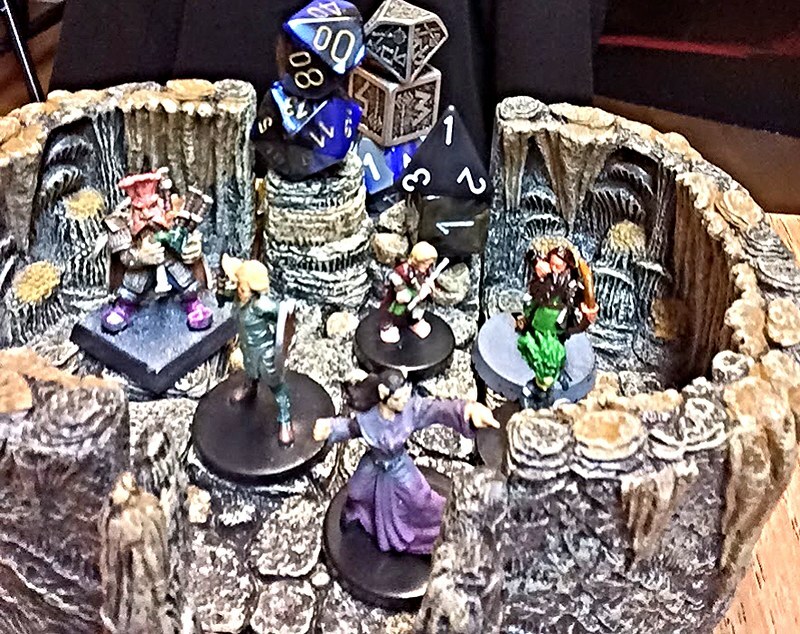 Weeks ago, the members of our unlikely band had been kidnapped from the surface world, and were pressed into service in Drow slave pits. After escaping their captors once, then recapture, they were pressed into service to make a delivery to the surface, but were sent without a guide. 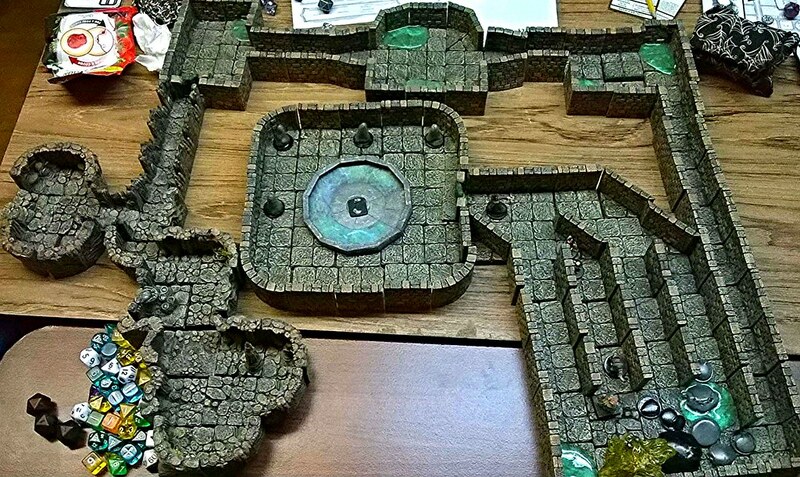 They’ve been wandering aimlessly for weeks, low on food, and fighting the environment and bizarre creatures and demons at every turn the eventually stumble into a ancient seemingly abandoned underground temple. 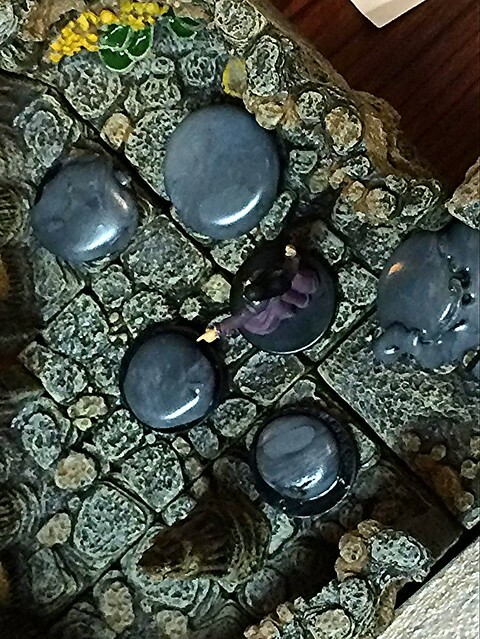 Immediately it became clear that the damage is the result of one of the many nearby underground rivers that run throughout the Underdark and that water is now leaking into the temple through new cracks in the walls. So the monk moves in, in full defensive posture..
Five Grey Oozes drop and attack immediately. The monk deflects all their blows… Amazing! 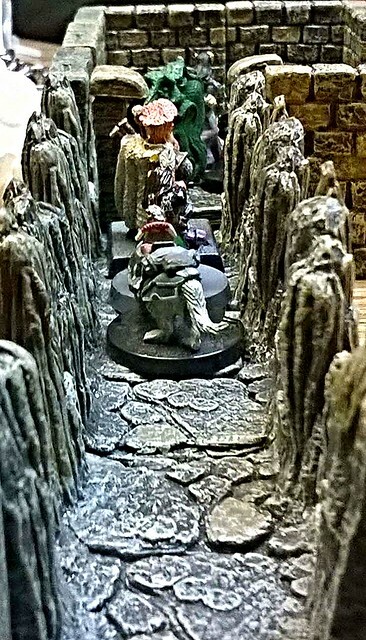 Content that the chamber is clear, they head back through the natural corridor to face a door to a stone-walled (constructed room.) The monk is cautious opening the door, then closing it again quickly. “What? Oh!” – The sound (almost of a child?) started by the door closing in turn startled the monk. “What?” she said, and the party behind her said “What? What?” as the hadn’t heard anything but the monk acting startled. “Nothing” said the monk, realizing she only heard the voice in her head. 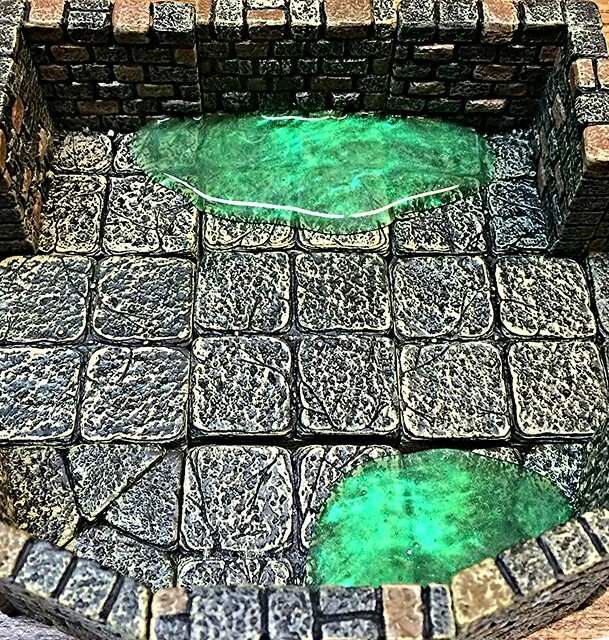 Opening the door again and shining light into the room reveals more new cracks and water seeping into the room faster than it is exiting, accumulating pools. “Wait! Let’s see!” the voice says to only the monk. 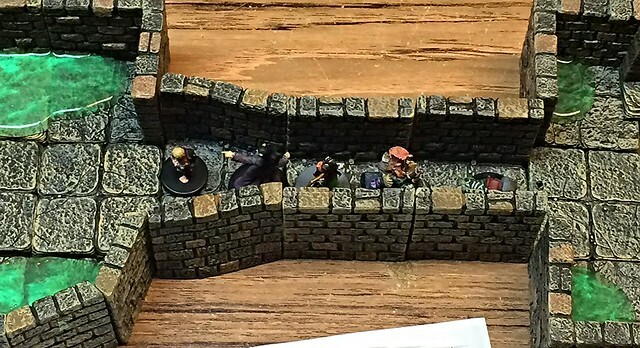 They move into the room cautiously keeping ranged weapons pointing upward, just in case. “Are you here to help?” pleads the disembodied voice. “What? 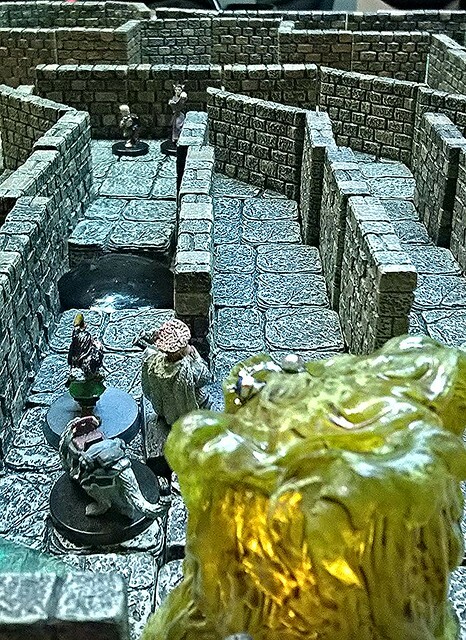 It’s a gelatinous cube – but it’s using telepathy, and it has two floating eyes ? 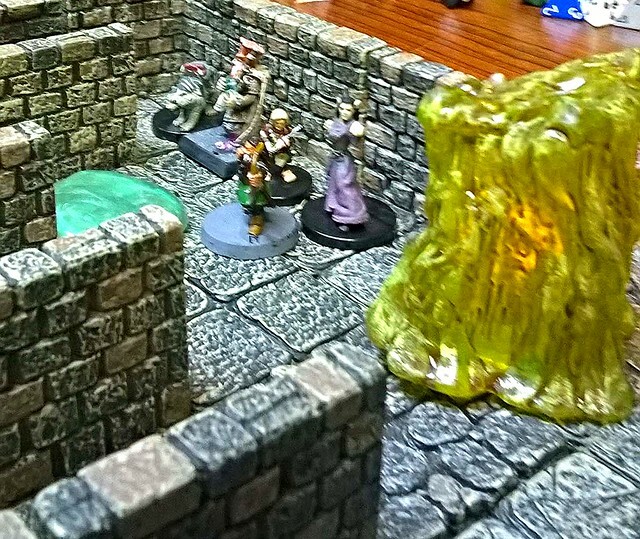 Is that glowing light inside it’s soul?” again, the druid is baffled. “Do we have a choice?” asks the Bard. 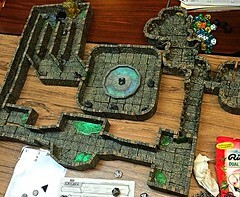 At that point the grey oozes in the last room (behind them) move up behind the party, on the floor, walls, and ceiling. 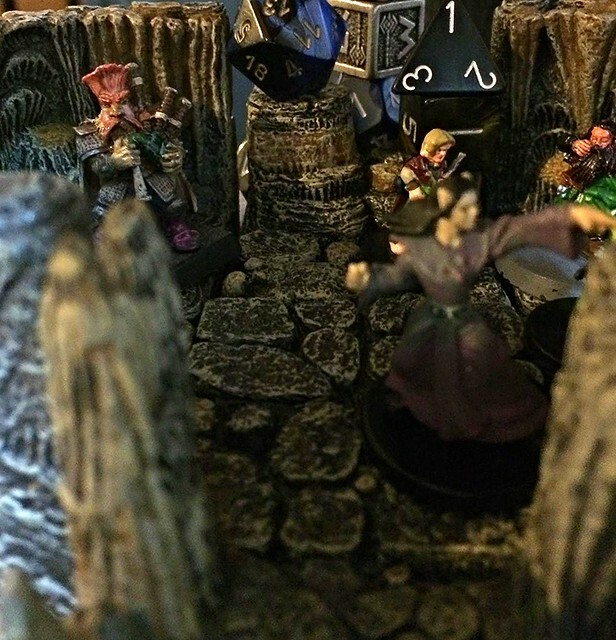 “Silly question…” retorts the cleric. “A test! 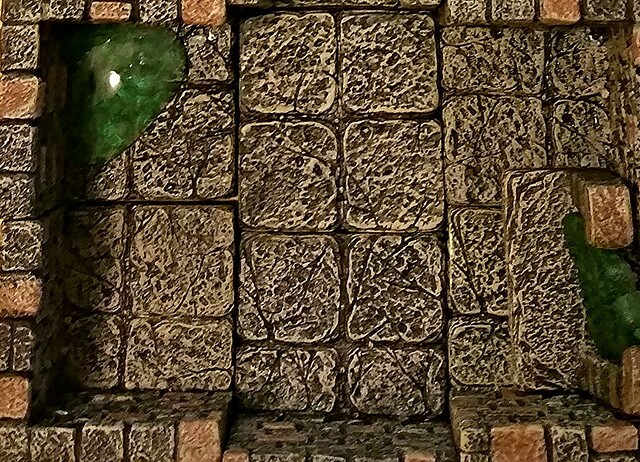 First a test of leadership!” blabbers the green cube. 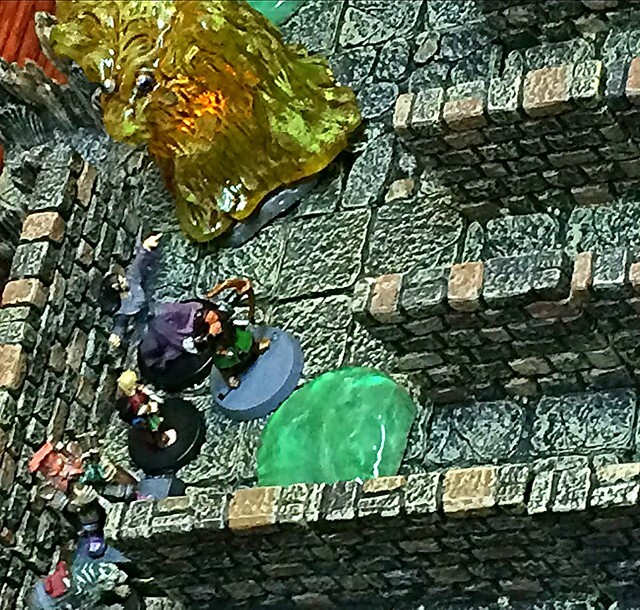 So Glabbagool leads the group down a long hallway, with the oozes bringing up the rear. 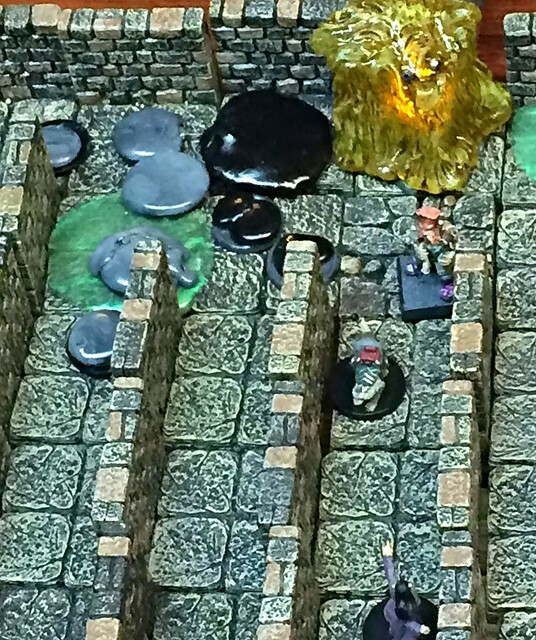 As they choose the farthest one, Glabbagool’s eyes follow the Monk without moving it’s body the eyes pass through it’s interior instead. “Gross” says the elf. 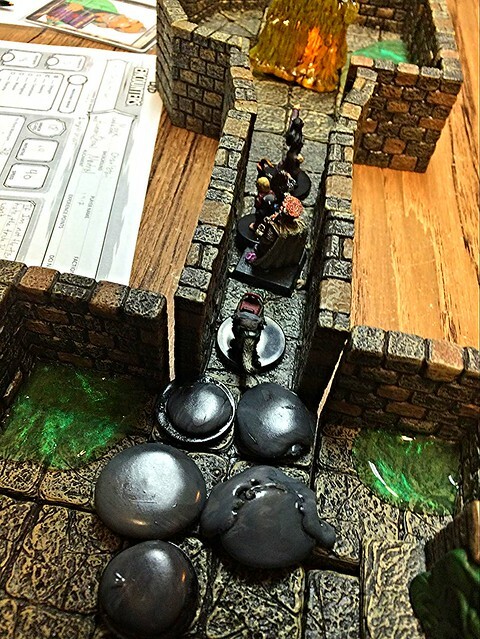 With clever halfling-tossing and leaping about they trigger a pit trap with no harm to themselves… At the bottom a Black pudding! After some fighting, healing, and more damage to weapons and armor, the pudding is defeated before it can escape to release another pudding. 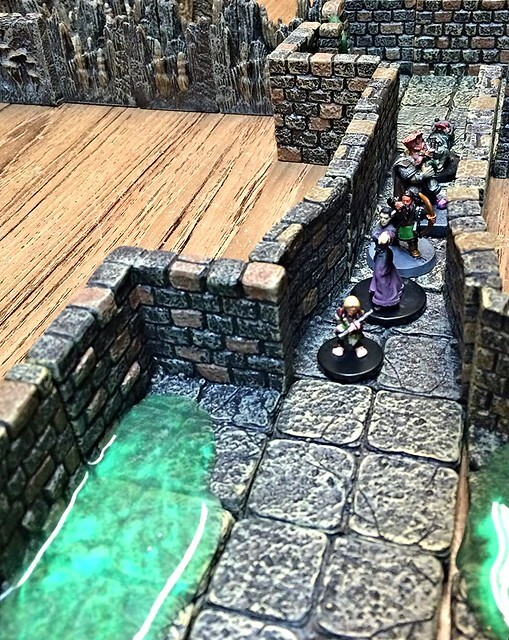 The party moves up a corridor and sets up an ambush at the next false floor. The black pudding never had a chance. Again it tried to escape to get allies, and again it was prevented. 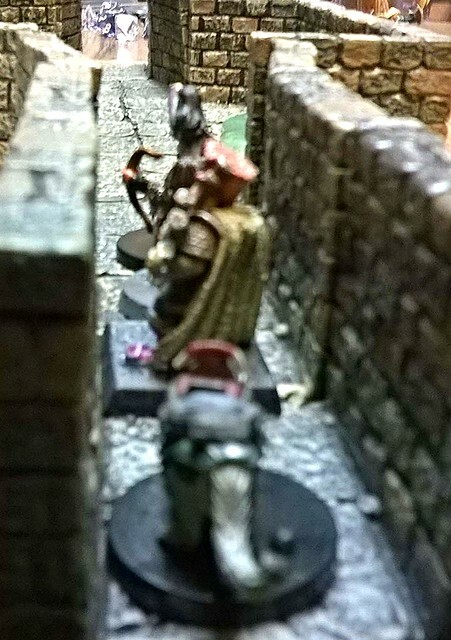 The archer is running low on arrows, and the monk is all but out of darts. But the last Puddings don’t wait.. they exit their lairs immediately. The fountain room contains the feet of a broken statue in the fountain area, and shapeless statues in four of sevent niches in the surrounding walls. The chamber is filling with water rapidly. “The river is against this wall. 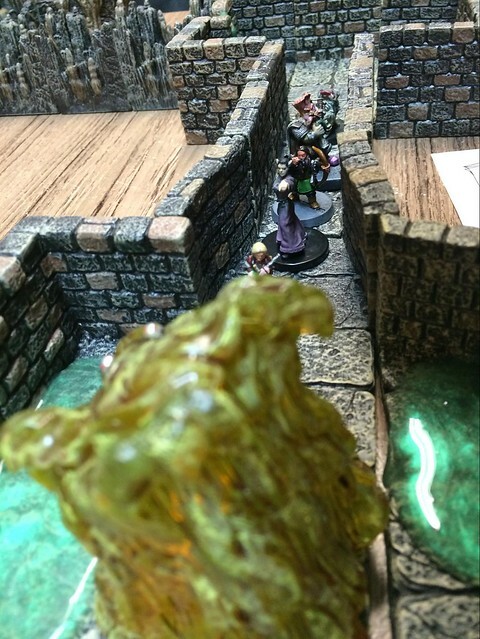 We can float up and out when you are ready.” – With that Glabbagool and the puddings jam themselves into the largest crack and expand themselves to break away a large section of wall/ceiling – and water pours in flooding the dungeon.